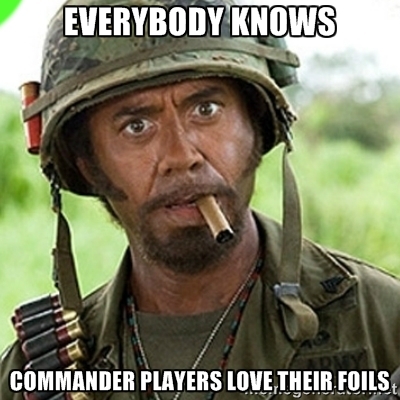 Commander 2014 is dawning upon us in just a few days, and it is exciting times for Commander players. While the new Commander cards have been discussed extensively, Commander is a deep format and there are a treasure trove of potentially undervalued cards in the format. Welcome to the first article in the Hunting for Commander Foils series. The series will comb through some of the most popular Commander cards to discover undervalued Commander foils. I mean everyone. Including that kitchen table kid who have never once ventured out. Besides, foils provide an extra layer of insulation against reprints. Take Solemn Simulacrum for example: the artifact incarnate of Jens Thorén was printed three times but the original Mirrodin foil with Jens Thorén’s face on it still demands a hefty $26.78, while the faceless art foil from M12 is currently at $15.15. Most popular Commander cards are at risk of being reprinted in the now annual Commander preconstructed decks. The Commander preconstructed decks will not contain any foils, so your foil Solemn Simulacrums have a better likelihood of retaining their value compared with their non-foil versions. I for one am excited for the red deck from Commander 2014, Built from Scratch. It is the most artifact-centric deck of all five Commander 2014 precons and I have an affinity for artifacts due to the nostalgia they evoke: I first picked up Magic during Urza’s Block, the era when artifacts were broken. That was the time of Kai Budde’s explosive Mono Red Artifact Wildfire deck that exploits the likes of Grim Monolith and Voltaic Key to generate insane amount of mana before locking out your opponent’s lands with Wildfire and Mishra’s Helix. A bit selfish, I know. But hey, there can only be one winner in every game of Magic. Oh, the deck beats its opponent to death with a dragon as well. It couldn’t get any sweeter than that. 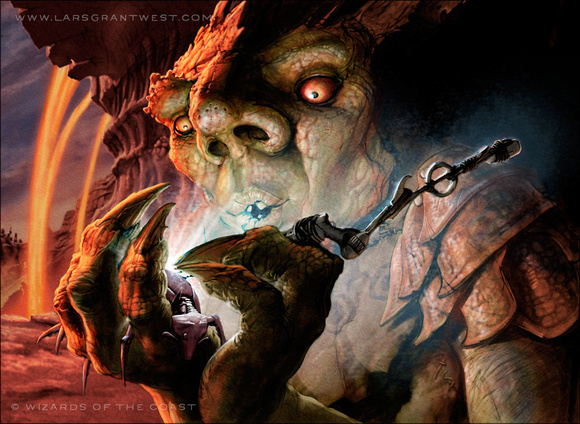 The following year featured two Mono Blue Artifact Tinker decks in an epic World Championship finals showdown between Jon Finkel and Bob Maher. Their decks ran a similar artifact acceleration package and land disruption as per Kai Budde’s Mono Red Artifact Wildfire, except they win via Tinkering for Phyrexian Colossus or 19/19 Phyrexian Processor tokens. While I started kitchen table Magic during Urza’s Block, my foray into Magic beyond the kitchen table began during Mirrodin. I have fond memories of splurging out my hand on turn one with Affinity. I never won much though; mirror matches were particularly difficult for a newbie like me. Its complicated board states and mind-boggling combat math with Disciple of the Vaults, artifact lands and Atogs were just too much to handle. And there were a lot of Affinity mirror matches. However, playing aggro never felt better than the few months Skullclamp was legal. Fair enough, the Affinity era was not the epitome of a healthy competitive metagame, but it sure ranks as one of the most overpowered meta in Magic’s history. Wizards has gotten better with their balancing act these days but artifacts still evoke a sense of forlorn in me, as a subset of cards that used to possess so much power, but is now powered down, nullified in the modern era of Magic. Nevertheless artifacts still play a crucial role in Magic’s most popular casual format, Commander. By virtue of their colorlessness, artifacts fit into any Commander decks, providing a slew of off-color abilities like ramp, card selection, life gain, sacrifice outlets and now even taking extra turns to decks that usually do not have access to them. Today’s article will discuss the financial potential of some of the most popular artifacts played in Commander. MTGSalvation.com EDH Primer Committee member scoeri have been running a pretty nifty script which trawls the site for user-posted Commander decklists and breaks down most played cards in various configurations. scoeri shared the list under the forum post Statistical Breakdown of the Commander Metagame (highly recommended for anyone interested in Commander stats). The database covers decks from the previous twelve months and is updated monthly, with the last count taking place on 31 October 2014. The database currently contains 3023 decks from 1473 users (decks posted or updated from 31 October 2013 – 31 October 2014). Shout-out to scoeri for the awesome database. 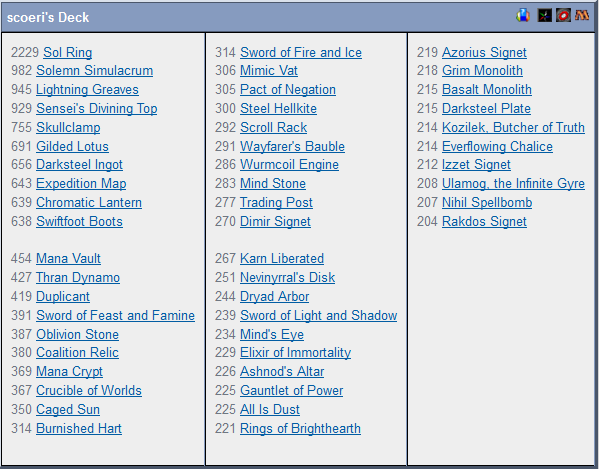 Here’s a snapshot of the top 50 colorless cards most played in Commander. 50 shades of colorless by scoeri, as seen on mtgsalvation.com. I chose the colorless list rather than the artifacts list as the colorless one includes artifact creatures. The list is exhaustive and for the sake of space and brevity, this article will cherry pick cards which financial relevancy could be discussed. While Sol Ring tops the list, there is not much to say about it as Sol Ring was reprinted to death in every single Commander decks Wizards release. Gilded Lotus and Darksteel Ingot are both in the top 10, but they are relatively cheap and stagnant over the years for the same reasons. The cards discussed are also preferably legal in both Multiplayer Commander and Duel Commander so there is a larger market for the foil version of the card, but exceptions could be made for extremely popular cards in either format. Lastly, the foils discussed are still within affordable range for most players to acquire: Sensei’s Divining Top is the fourth most-played artifact, but a foil Champions of Kamigawa copy has a price tag of $118 and a From the Vaults: Exiled foil sets you back $53. There is not much point expounding the virtues of a foil that only a small segment of readers could afford. I solemnly swear to be in each and every one of your Commander decks. The second most popular artifact in the list, lagging behind only Sol Ring. While the foil price for the original Mirrodin version have been stagnant, the foil M12 copy have been slowly trending up in price since the start of 2014. Originally a blue-green card, Solemn Simulacrum gives decks access to two important abilities which are almost universally desired by any Commander decks: blue’s cantripping, and green’s mana ramp and color fixing. 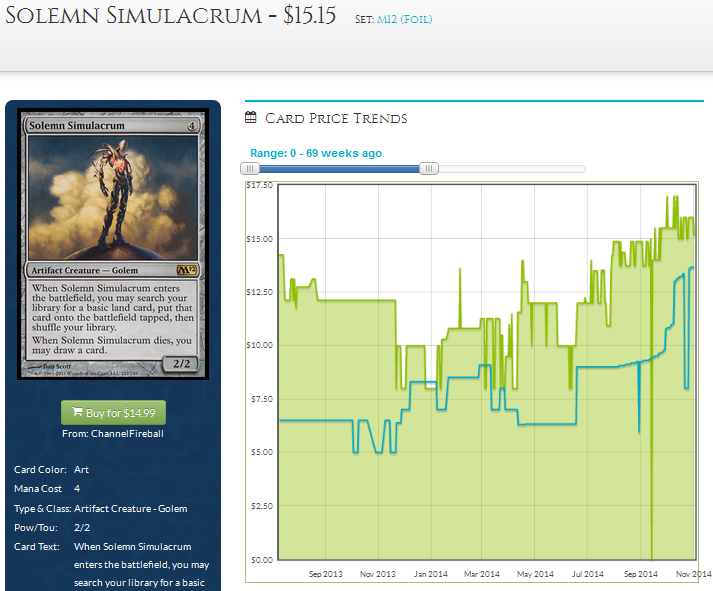 It comes with no surprise that Solemn Simulacrum is played in 32% of the Commander decks tallied by scoeri. Verdict: $15 is a bit steep as a spec target. However I would like to get my own foil copy or copies at $15. I personally would not get the $27 Mirrodin copy, but I am sure there are some diehard pimpers out there who would prefer the original art. Third down the list, being played in 31% of the decks counted, Lightning Greaves is a staple in Commander decks built around a Commander that attacks, have an activated ability that requires tapping or is a combo piece. 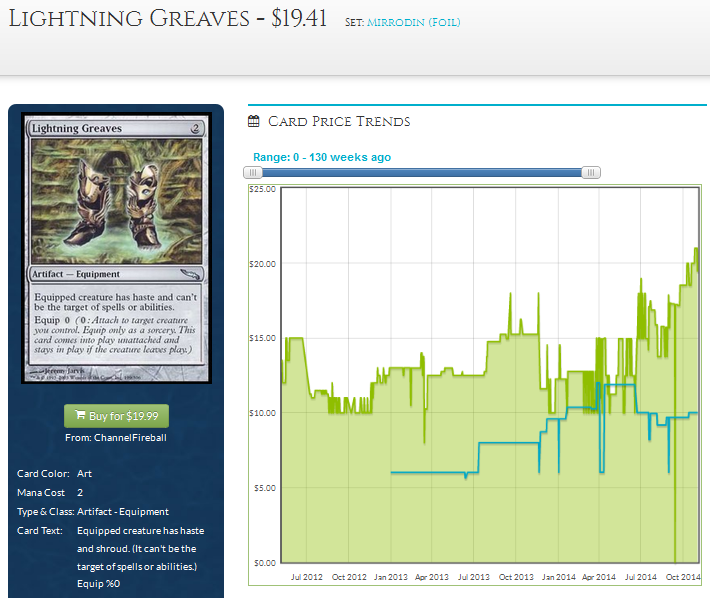 Verdict: I do not like like Lightning Greaves as a spec or acquisition at $18. Lightning Greaves would be hard pressed to see another foil printing as Wizards is replacing shroud with hexproof. Furthermore, players unwilling to splash $18 – $20 for a pair of shoes might just opt for a pair of $5 foil Swiftfoot Boots. Was supposed to be +1/+2. Skullclamp is one of the reasons why I love my Purphoros, God the Tokens and Prossh, Kobold Babymaker Commander decks. One mana, sacrifice a token, draw two cards ranks as one of the best guilty pleasures of running a tokens deck. 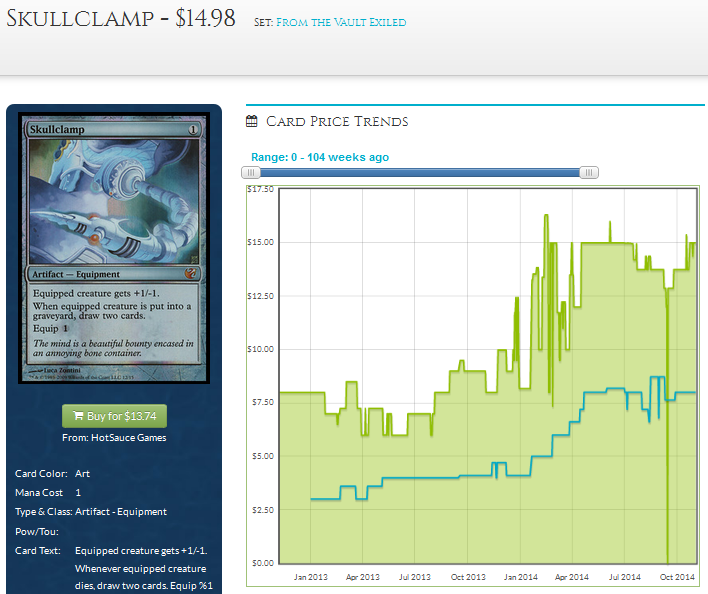 While not nearly as ubiquitous as Solemn Simulacrum, Skullclamp is played in 25% of the Commander decks counted. Verdict: $15 is a steep entry for a spec, but unlike Solemn Simulacrum foils, we are unlikely to see another printing of foil Skullclamp. Skullclamp was a mistake and is extremely unlikely to see another reprint outside the Commander decks, which contains no foils. Darksteel’s print run is likely to be significantly lower than the current print run of Standard sets, and FTV:Exiled is a limited edition product. Also unlike foil Lightning Greaves, there is no other card that achieves the same effect (or even close to) as Skullclamp. If you can get any copies at $15 now, go get it. Select your expedition! Adventure guaranteed, survival no so much. Expedition Map grants the power to search for any lands to any deck. And its pretty cheap to activate. Most Commander decks run utility lands, be it Cavern of Souls to make your Commander uncounterable, or Academy Ruins to recur incessant artifacts. Expedition Map is a $13 foil common, a price also buoyed by Modern Tron. 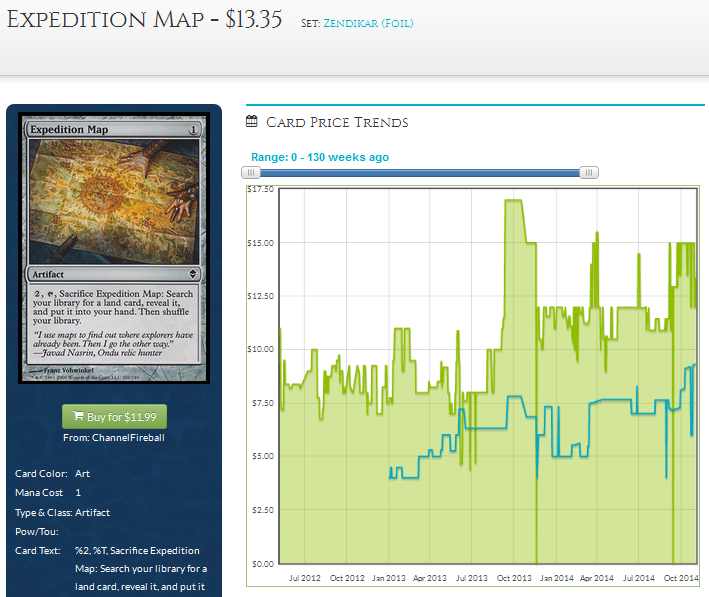 Verdict: Unlike the other cards discussed above, the price of foil Expedition Map is at risk of being tanked by a reprint. It is a common, which means a reprint will see a larger influx of foil copies than the cards discussed above. Lightning Greaves and Skullclamp are uncommons but their ability makes unlikely to be reprinted, while Expedition Map’s ability could fit anywhere. Its status as a Modern Tron staple is double edged: while it keeps the price high, it also means that foils of the card could be reprinted en masse not just in normal sets, but also in Modern Masters II. We are just scraping the tip of the list, stay tuned next week for the second part of Hunting for Commander Foils: Artifacts. Thanks for the suggestions RaidtheRevenge. I am making my way down scoeri’s list, I believe I’ll be touching on Signets and Wayfarer’s Bauble soon! Coolsteel Heart looks interesting too. An “I can be anything” Diamond? That’s pretty awesome. Great article. Excited for the next! Thank you Nick! Glad you’ve enjoyed it.